The interface is evolving. What has long been dominated by screens of all shapes and sizes is now being encroached upon by the voice. And while many companies are building voice interfaces — Apple with Siri, Google with Assistant, and Microsoft with Cortana — none are quite as dominant as Amazon has been with Alexa. At the AWS reinvent conference, Amazon announced Alexa for Business (as CNBC first reported). The new platform will let companies build out their own skills and integrations for both practical and business use cases. As AWS CTO Werner Vogels noted during his keynote, voice support is a major focus for the company, which aims to “unlock digital systems for everyone.” To enable this, Vogels believes that we have to go beyond apps and smartphones — and that doesn’t really come as a surprise, given Amazon’s non-existent smartphone ecosystem and its success in the smart speaker world. It’s now building on this to bring Alexa out of the home and into the office. The first focus for Alexa for Business is conference room. AWS is working with the likes of Polycom and other video and audio conferencing providers to enable this. 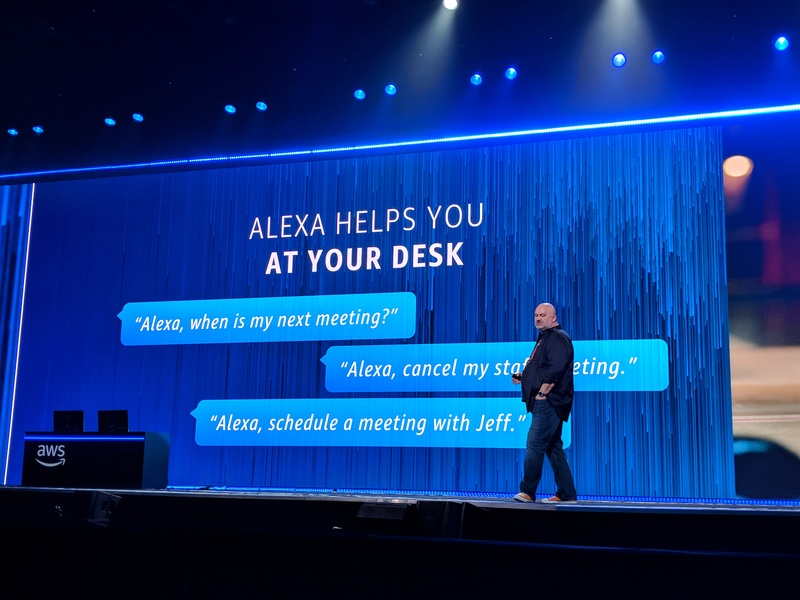 In addition, AWS also worked with Microsoft to enable better support for its suite of productivity services, as well as other enterprise services likes of Concur and Splunk to bring their services to Alexa. Other partners include Capital One, WeWork and JPL. Just as developers can build skills for Amazon Echo users, businesses can now build out Alexa skills for use within their own company. You could imagine voice access to an employee directory, Salesforce data on various clients and accounts, or company calendar information. There are also more practical uses for Alexa in a work setting, such as changing the temperature in a particular conference room or turning the lights on and off. Plus, Alexa for Business has all the same capabilities as a regular old Echo, letting users get information about news, weather, set timers and alarms, and ask questions. Alexa for Business is a two-sided project for Amazon. On the one hand, Amazon gets added data and revenue from larger-scale customers and, on the other, enterprise businesses will likely hop on the platform to build APIs and skills for a new breed of customer. For example, Concur has built out a skill that lets users ‘ask Concur’ when they need to leave for the airport for a business trip, according to the WSJ. WeWork, another partner in the beta, will let enterprise customers and WeWork HQ employees control the lights and reserve meeting rooms using their voice. The WSJ reports that Alexa for Business will also give enterprise users the opportunity to build apps and skills for calendar management, meeting room scheduling and ordering supplies. The introduction of Alexa for Business also presents an opportunity to let users access business information on their phones or outside of the building using the Alexa app on their phone. But the first challenge is getting large companies to invest in a huge quantity of Echo devices. Given the shift toward voice interfaces, it’s likely not a question of if, but when.